Here’s the link for the challenge that this picture is for! The nail polish represents my short and stubby nails which I have grown to love and appreciate, although I was originally ashamed of them. The purple glasses are straw glasses, which I drink water through; they represent my spontaneity and the great memories that I made over the summer. The book A Tree Grows in Brooklyn represents my favorite book which indirectly taught me a lot of mini life lessons. The set of keys embodies some of the first responsibilities and freedoms recently bestowed upon me, which I very much appreciate. 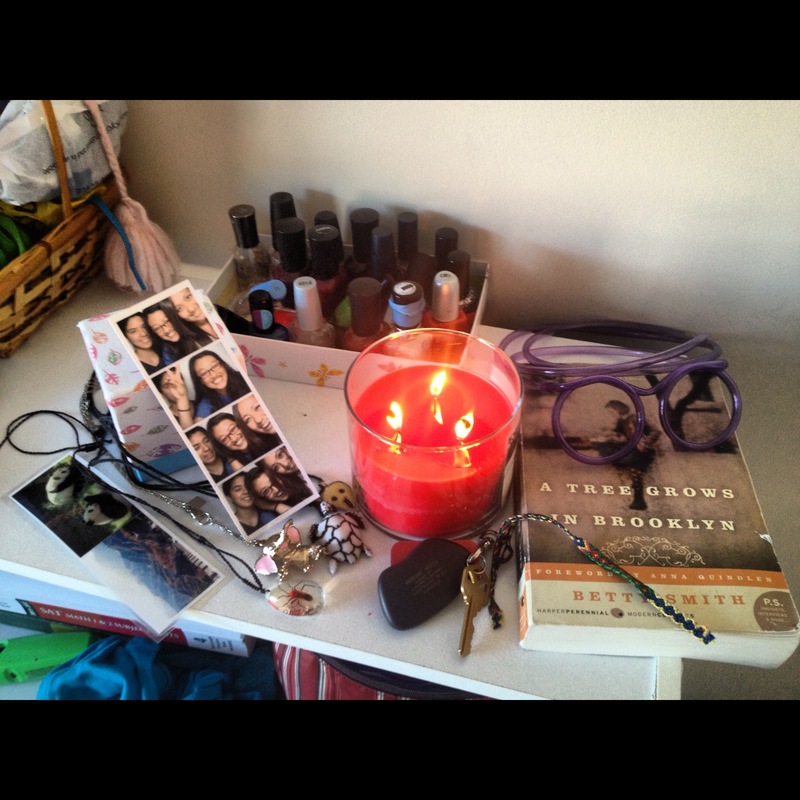 The candle stands for warmth and light, and one of many material possessions I obsess about. The friendship bracelet is long worn and broken, but still represents a long lasting friendship maintained for years, after ups and downs. The necklace with the “Scream” painting pendant sort of thing is a little trinket that I got years and years ago for 50 cents at one of those machines in a restaurant. I had always regarded it as my alien necklace, until someone pointed out this summer that it was the face of the Scream, not an alien. It means spending lots of money isn’t necessarily to acquire something wonderful and meaningful. The necklace with a fake bug inside of it was a souvenir from China that I bought two years ago, which I wear very often. It’s a staple of mine. The turtle necklace is something that my camp roommate bought for me while she was in Hawaii and I’ve always loved it. The elephant necklace is perfect of the peculiar necklaces that I like to wear, which range from keychains on a string to sparkly flowers. The panda bookmark was created years and years ago when I was in elementary school by my dad. It was one of many that I asked him to make so I could pass them out at show and tell, and it represents my heritage and my childhood, both of which I loved and appreciated so much. The photo strip is one of many taken this summer; it represents an unforgettable experience that is equally as lifechanging. The pretty box holds my debate timers, which I pride myself over for having more than enough. It’s a great object to depict my love of debate. Opinions are easy to come by, original thought is a little harder. I like what and how you write… keep it coming. You’re a brilliant writer and your debating skills are very apparent in your blogging ability as well. I just adore your Visual Tribute and I have added it to my post along with my comments on it. You took on the hardest challenge – to make a tribute to yourself! Well done! I’m impressed! Later on, I will update my blog to show that we have a Winner for first place so everyone will know. I have already said it on Facebook for people who follow through that route. Thank you! It was very interesting to do all 5 parts of the challenge, and the Visual Tribute took a lot of consideration and I basically just raided my closet boxes :) I’ll be sure to display the award on my blog, and thanks again for everything, the feedback, the challenges, etc.